Due to the presence of obstacles, fixed or mobile, narrow places, locations with a high number of obstacles, doors, safety valves and other elements in typical human environments, mobile manipulators require a high level of autonomy in movements and manipulation. To cope with autonomy requirements a combination of displacement, manipulation and sensorial capabilites are nedeed. Other important aspect in many kind of environments is the presence of persons. Safety considerations has been taken into consideration in the design, in those aspects relatives to the manipulator (light wheight and moderate speeds, and also in the functional architecture of the robot. MANFRED has a coordinated control of all degree of freedom in the system (the mobile base has 2 DOF and the manipulator has 6 DOF) to achieve smooth movement. 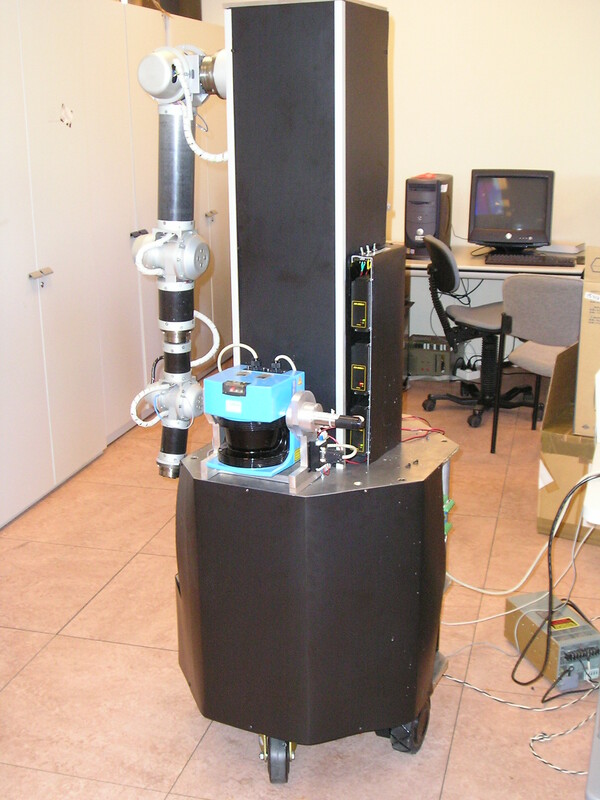 This mobile manipulator use a sensorial system based in vision and 3-D laser telemetry to perceive and model 3-D environments. The mobile manipulator will include all the capabilities needed to navigate, localize and avoid obstacles safely through the environment.